Are Salt Substitutes the Answer? The two major components of salt are sodium and chloride. The human body needs both to function properly, and indeed, human taste buds are programmed to seek out salty food. Sodium helps to regulate the amount of fluid, including blood, in the body. Chloride is a component of gastric (stomach) juice, which aids in the digestion and absorption of many nutrients. Consuming too much sodium, however, can contribute to numerous health problems. Today, salt is cheap and plentiful, and most Americans consume more than the recommended amount. According to the Food and Nutrition Board of the Institute of Medicine, an adequate intake of salt for adults ages 19–50 is 3.8 grams of salt (or 1500 milligrams of sodium). For adults ages 51–70 it’s 3.3 grams of salt (or 1300 milligrams of sodium), and for adults 71 and older, it’s 3.0 grams of salt (or 1200 milligrams of sodium). However, one study estimates that men consume an average of 10.4 grams of salt (about 2 teaspoons) each day, and women, 7.3 grams (about 1.5 teaspoons) – amounts that represent an increase over previous years. Most of this salt – 75% to 80% – comes from packaged foods, which use salt and various other forms of sodium as a preservative as well as a flavoring, and from restaurant food, which is often heavily salted. A lifetime of high sodium intake puts the body at risk for hypertension (high blood pressure), cardiovascular disease, stomach cancer, and potentially osteoporosis. Having diabetes raises the risk of hypertension, and having both diabetes and hypertension greatly raises the risk of kidney problems, heart disease, retinopathy (an eye disease), and stroke. Keeping blood glucose and blood pressure levels in your target range as much as possible is important to help protect your kidneys and blood vessels from harm. But before you replace the salt in your home cooking with salt substitutes, make sure you have really removed the salt and sodium from your spice cabinet and pantry. First, be aware that “salted” spices like garlic salt and adobo are mostly salt and therefore high in sodium; it is better to season your food with powders such as garlic or onion powder, which do not have added sodium. If you are unsure if your spice mixture has sodium, just check the ingredients list: It will list “salt” if it is present. 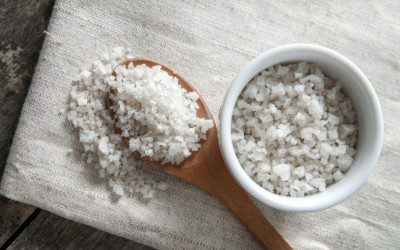 Also be aware that although kosher salt and sea salt have slightly different flavors and origins from table salt (sodium chloride, which is 40% sodium, 60% chloride), they have an almost identical sodium content per gram. Any type of coarse salt will have less sodium per teaspoon because the granules are larger, so less salt fits into the teaspoon. Just one teaspoon (5.8 grams) of granulated table salt has almost 100% of the Daily Value of sodium, which is set at 2400 mg. There are several different categories of salt substitutes. Some are sodium-free and others just contain less sodium than regular salt. Each has pros and cons in terms of flavor and nutrition. Reduced-sodium salt substitutes. These products, such as Morton’s Lite Salt, contain varying amounts of salt, so they taste the most like salt. Most are a mixture of sodium and potassium chloride, another chemical compound with a salty taste. Generally, they contain 25% to 50% less sodium per serving than regular salt. Reduced-sodium salt substitutes may be best for those who eat mostly home-cooked food and do not already have high blood pressure. If you eat packaged or preprepared food regularly, any amount of added salt, even from lower-sodium substitutes, is likely to increase your sodium intake above the recommended levels. If you already have high blood pressure and have been advised to follow a sodium-restricted diet (usually with no more than 1,000—2,000 mg daily), it would be wise to choose a salt substitute that is completely sodium-free. Potassium-based salt substitutes. Potassium is the primary ingredient in sodium-free salt substitutes because of its salty flavor. Unlike regular salt, however, potassium chloride salt substitutes can have a bitter taste, so an amino acid (L-lysine monohydrochloride) is often added to offset the bitterness. Even then, some people still find the flavor unpleasant. The upside of using potassium-based salt substitutes is that they are completely sodium-free and are also a good source of potassium in the diet, with some containing over 15% of the Daily Value in just G teaspoon. The best natural sources of potassium are minimally processed fruits and vegetables, which is why the average American diet is as notoriously low in potassium as it is high in sodium. Potassium helps lower blood pressure, just as sodium raises it. It may also play a role in blood glucose control. One study of people with high blood pressure who were using a type of diuretic (blood pressure medicine) that lowers potassium in the body showed that people with lower levels of potassium had decreased insulin secretion and higher blood glucose. The downside of potassium chloride salt substitutes is that they are not safe for people with kidney insufficiency or disease. That’s because as the kidneys fail, they lose their ability to expel all minerals, including potassium. A person with diminished kidney function generally needs to limit the amounts of calcium, potassium, and phosphorus he consumes. The only other potential downside to using potassium-based salt substitutes is that – similar to the idea that using artificial sweeteners and drinking diet soda just perpetuates the “sweet tooth” rather than curbing it – using salty potassium chloride in place of salt would not really be “training” your taste buds to enjoy food with less salt, just tricking them into thinking you are eating it. Herb mixes. Herb mixes, such as Mrs. Dash, are sodium-free and usually have minimal to zero potassium, so they are safe for those with kidney problems. Many herbs are known for their antioxidant or other health properties, so these may have added benefit beyond adding flavor to low-sodium dishes. The choices are many (there are 15 varieties of Mrs. Dash alone) and if you are so inclined, it is quite simple to prepare your own dried herb blend (see the recipe for “Low-Sodium Herb-Roasted Chicken” for an example of herbs to blend). As mentioned earlier, maintaining a low sodium intake is relatively easy if you prepare all of your own food from fresh ingredients. However, that is easier said than done, so it is fortunate that there have been some recent initiatives from the Food and Drug Administration (FDA) and other organizations urging (and perhaps soon requiring) food manufacturers to reduce the amount of added sodium in packaged foods. Many large food corporations are already starting to comply. For example, Heinz announced in early 2010 that it was changing its ketchup recipe for the first time in 40 years, reducing the sodium content by 15%, from 190 to 160 mg per tablespoon. It’s worth noting that 160 mg is still 6% of the Daily Value for sodium, so even this new recipe does not meet the standard definition of a low-sodium food, and many people use more than one tablespoon of ketchup at a time. However, this is a step in the right direction to help consumers have more control over the amount of sodium in their diets without giving up all convenience foods or eating at restaurants. A study published in February 2010 in The New England Journal of Medicine estimates that if all Americans cut their sodium intake by 1200 mg (the amount in about half a teaspoon of salt) per day, it would have a similar or greater impact on coronary heart disease, heart attacks, and stroke than if half of all smokers quit or all obese adults reduced their body-mass index by 5%. Perhaps most compelling, the study predicts that this change would be equally as powerful as using blood pressure medicines for reducing deaths from hypertension, and it would remove the risk of side effects from antihypertensives, as well. What is also interesting about these numbers is that removing 1200 mg of sodium daily from the average diet would still not bring sodium intake levels down to the current recommendations, but it would do a great deal of good. That means that replacing just half a teaspoon of the table salt you add to foods with a sodium-free salt substitute can have a meaningful effect on your health. To maximize that effect, also select packaged foods with as little added sodium as possible. While very-low-sodium diets are difficult to maintain, making these modest yet effective reductions can be relatively simple. Julie Lichty Balay is a nutrition consultant and educator in New York City and Bergen County, New Jersey. Her Web site is www.jlbnutrition.com.